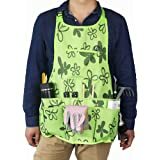 Durable apron allows access to tools when kneeling, it has a top pocket and 13 further pockets for holding garden hand tools and essentials. Included a top pocket,5 big pockets,4 medium pockets and 4 small pockets. There is a key clip and adjustable strap and belt to make it comfortable to wear and fit all sizes. High Quality Thickening Oxford cloth,Waterproof and Wear-resistant.A very easy and convenient apron to storage tools in garden. 100% RISK FREE PURCHASE: If you any problems with the apron, we will offer you a money back guarantee - Peace of mind if purchasing for professional & home use or as a gift for your friends or family member! for holding garden hand tools and essentials. Included 5 big pockets,4 medium pockets and 4 small pockets. High Quality Thickening Oxford cloth,Waterproof and Wear-resistant. A useful and convenient apron to storage tools in garden. There are 14 pockets,Including a top pocket,5 big pockets,4 medium pockets and 4 small pockets. We bought this as a gift for my brother-in-law who is a rather large guy. The quality is good. Nice, heavy denim. We liked all the pockets. It seems like it will hold up well. It even came with extra buttons, which should help it last even longer. The shoulder straps can be connected in two different ways, which gives it even more versatility. The reason we gave it a 4 instead of a 5 is that the waist tie straps were very short. I know I am not a petite flower, but every other part of the apron was big on me (which it needed to be to fit the brother-in-law), and the waist ties just barely made a bow around my waist. Since I sew I was able to add an additional length to the two ties, which made it perfect. It just seems like those waist ties were way too short compared to the sizing of the rest of it. 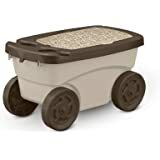 5.0 out of 5 starsNice, durable and convenient! Very nice and handy product. Materials are very durable. Plenty of pockets and 2 hammer loops for tools and pens etc. A 6x6 in. chest pocket, 5 5x5 in. pockets, top center waist pocket for pens, and 4 2x6 in. pockets. Has an adjustable neck and waist loops that clip together. 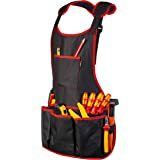 Holds everything I need for whatever job I'm doing whether it's auto, yard, electrical, plumbing etc. Will definitely be buying several more in the near future. And yes, I do recommend this product. This apron is wonderful. 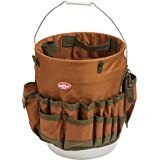 I purchased it for housecleaning and it has a wealth of great pockets and two loops for hanging bottles or other items. Some have commented that it's shorter than expected, and I can understand it if the person is quite tall. I'm 5' 4" and it hits me at about the upper thigh which is perfect for reaching items in the pockets. 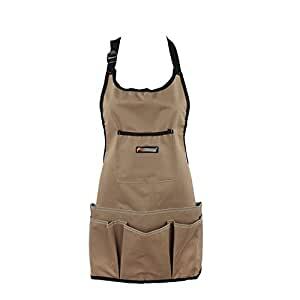 I latched onto the idea of a cleaning apron years ago from a company called The Clean Team (I think) and it's a great idea to have all of your cleaning/gardening/etc. accessories to hand when you're working. It's also a very sturdy fabric. I highly recommend it. Bought these for my husband and his employees at work. He said he liked it especially because of the pockets and the fact that he doesnt have to the it in the back. The criss cross of the back straps holds ot on him just fine and he doesnt feel restricted. He is a boot and leather repairman and he wanted to make it even shorter but I talked him out of that. Hes 5'10" and it hit him just above the knees and he's high waisted so ours werent too short like other reviews are complaining about. So far the pockets have held up, with his company phone amd various tools and pen.